Sleep training is the process of teaching your baby/toddler/child to sleep through the night. To go to sleep without difficulty, to settle themselves if they do wake in the night and to wake at a ‘reasonable’ hour. If you are a parent of a child or children who do not sleep well this will sound like un-achievable bliss no doubt. The fact of the matter is that continued sleep deprivation is not healthy for parents or children and a good nights sleep benefits everyone. Nevertheless for thousands of families poor sleep patterns are commonplace. My dad still talks about when I was small as if it was the most torturous time of his life as I didn’t sleep a night through until I was three! After all sleep deprivation IS a form of torture! All you parents will understand why! A parent of a child who won’t sleep, stay asleep or one who wakes at ridiculous o’clock as we term it in our house (basically before 6.30am) will try just about anything going to see if it works. The big booming baby and child industry has cottoned onto this and there are now all sorts of ‘sleep aids‘ on the market. The truth is that what works for one family might be a disaster for the next so sometimes it is a bit of trial and error to see what works best for your child(ren). We have recently become aware of a sleep training aid called Sam. Sam is a sheep who is available to buy in pink, grey or blue. Sam’s eyes open and close to signify when it is time to sleep and when it is time to wake. It can be set for different times so it can easily be used for naps as well as night time sleeping. 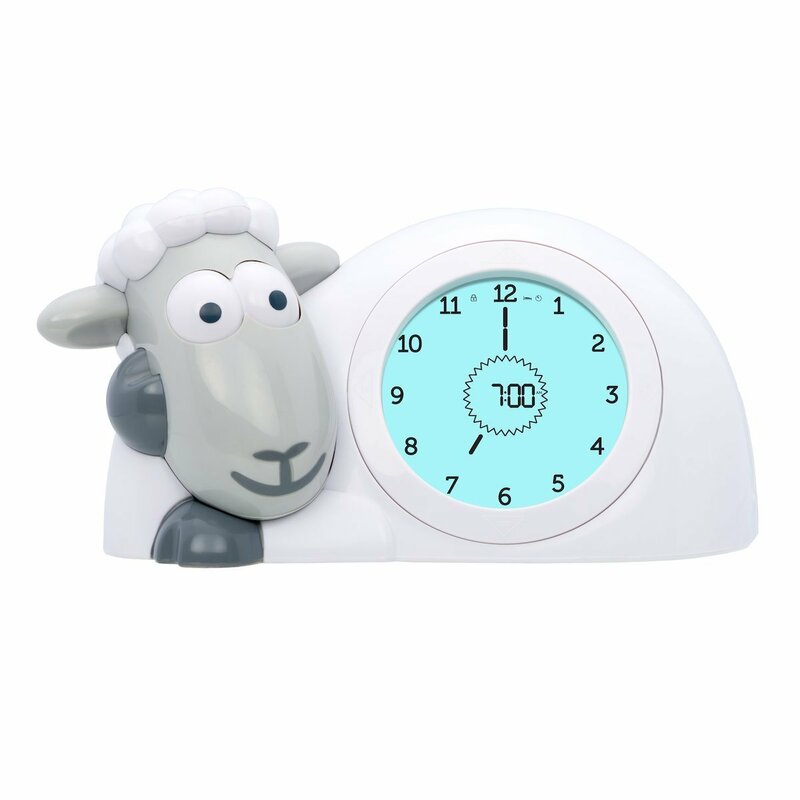 The LCD screen changes colour to indicate sleeping and waking up times and because of the clock face this can be used for older children as well.This means it is one of those products with longevity, always appealing to parents. Sam is very cute with a very appealing face and the unit is very neat. The distinction between light blue and dark blue is a bit lost on little ones, it really needs to be a different colour but the eyes open and closed is more easily understood. It doubles as a great night light and is silent, so no annoying ticking to contend with. It is taking some time to adjust to using this and I think it needs to be consistently used for sometime to establish how well it works. In principle I am totally sold on the idea, so watch this space for further updates! You are absolutely right when you say what works for some won’t work for others. Unfortunately, there is no “one size fits all” when it comes to sleep training/coaching. With so many different theories out there, it can be difficult to figure out what style or method is right for you and your baby. Speaking to an experienced sleep consultant can help you narrow down your options and find a method that is going to work for you. Sleep training success is all about support and feeling confident with the method you have chosen. Sleeptrainmybaby.com will always be happy to help any parent who is struggling with this tricky skill.